As 201, there are over 19,000 vessels in Hong Kong, including 8,491 pleasure vessels. However, total number of sheltered berthing and moorings is only less than 5,000. This shortage in safe berthing and mooring is growing day by day and is limiting the economic development of marine-related industries, including ship-repairing/building, sales of vessels, spare parts and component manufacturing, insurance, etc. Another major implication is that the cost of mooring has become unaffordable for the common person in Hong Kong. Only the ultra rich can have access to marinas and the cost of moorings sublet in the private market have risen to over HK$20,000/month. This costs restricts private boat ownership and is resulting in a lack of labour skilled in marine activities. This is consistent with the observations by Marine Department which has found it difficult to hire management with marine experience. There are 344 private moorings and 99 club moorings in Aberdeen Typhoon Shelter for pleasure vessels. However, in the latest statistics provided by MD, the total number of vessels seen in the shelter on 21 September 2013 during Typhoon Usagi was 550, meaning an additional 107 pleasure vessels sought refuge at the shelter without safe and proper moorings. A petition was held on 30 April 2013 with the industries united in one simple message - 'Safe Moorings NOW!'. 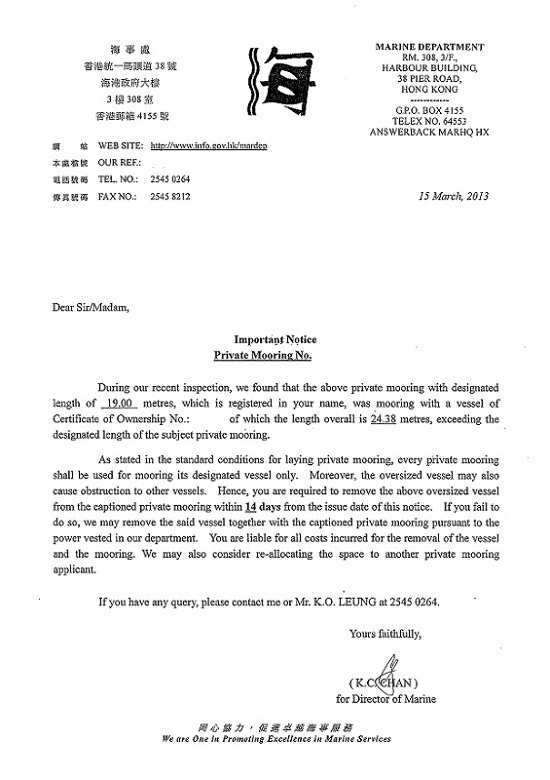 See press release at www.moorings.hk . Designing Hong Kong Limited welcomes the comprehensive review and fundamental reform of the Marine Department, and the setting up of a Steering Committee on the Systemic Reform of the Marine Department chaired by the Secretary for Transport and Housing. The safety of vessels and the development of the local marine industry is compromised by a lack of safe moorings. At the end of 2012, the Marine Department has issued licences for 12,023 pleasure boats and sampans, but provides only 3,320 safe moorings, forcing over 8,000 boats to moor in unsafe locations and using non-compliant and improvised moorings. Unsafe piers such as in Deep Water Bay and along Aberdeen Harbour’s waterfront are tolerated. Public piers generally lack barrier-free access. The Central Ferry Piers are designed for handling passengers but continue to handle cargo. Shipyards required for maintenance of vessels are limited to short-term land tenancies, resulting in low quality facilities (see Po Chong Wan, Ap Lei Chau Praya Road). “Many of these failures are not only the result of a lack of technical leadership from the Marine Department, but also a lack of policy leadership. We urge the Administration to expand the review beyond the Marine Department, and to include the Maritime Section of the Transport and Housing Bureau. The objective of the review should be to improve safety as well as the ability of the Administration to provide policy steer which meets the changing circumstances and aspirations of the community and marine related industries,” says Paul Zimmerman, CEO Designing Hong Kong Limited. Over 60 people from an alliance of interests in pleasure boating, including the Southern District Ship Builders Association, Designing Hong Kong, Hong Kong Marine Industry Association, owners and crew of vessels, and management and staff of marine operators, petitioned the Secretary for Transport and Housing yesterday to address the serious shortage of safe moorings in Hong Kong. See http://www.designinghongkong.com/v3/?p=574 for details. 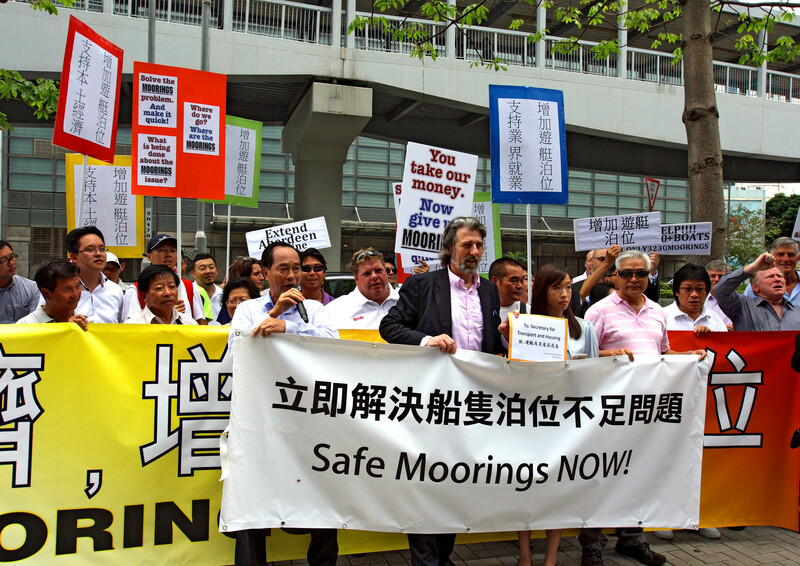 Hong Kong, 30 April 2013 – Over 60 people from an alliance of interests in pleasure boating, including the Southern District Ship Builders Association, Designing Hong Kong, Hong Kong Marine Industry Association, owners and crew of vessels, and management and staff of marine operators, petitioned the Secretary for Transport and Housing to address the serious shortage of safe moorings in Hong Kong. The marine industry called on the Government to address the shortfall of safe moorings for the increasing number of boats used for tourism, pleasure, recreation and sports. They also urged for an extension of the deadline for termination of non-compliant moorings in Aberdeen until safe alternative mooring areas have been made available. At the end of 2012, 7,920 pleasure vessels and 4,103 transportation, fishing and outdoor open sampans – or over 12,023 vessels used for tourism, leisure, recreation, line fishing and water sports had been licensed by the Marine Department. However, only 2,280 moorings in private marinas and 950 private moorings, or 3,230 safe moorings have been made available in Hong Kong. Taking account of an estimated 800 dry berths (storage facilities on land) offered by marinas and private operators, there is a shortfall of close to 8,000 safe berths. 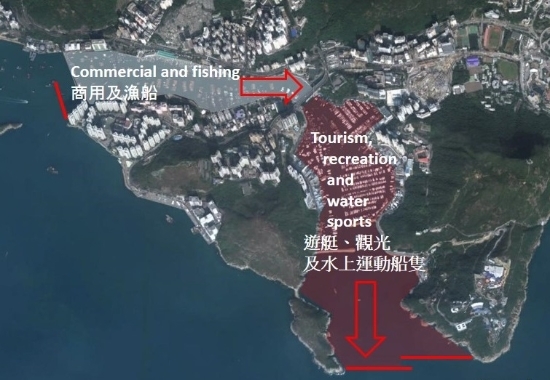 This has resulted in subletting of moorings at high prices, and makes it impossible for people – except for the super rich – to enjoy Hong Kong’s magnificent shore lines and beautiful waters. The shortfall of sheltered moorings hurts the image of Hong Kong and limits job opportunities in crewing for boats, ship repairs and marine related industries at a time when the fishing industry is seeking alternative jobs to compensate for the trawling ban. The systemic shortfall has also resulted in oversized vessels moored on undersized moorings. This was aggravated in 2009 when vessels were moved to Aberdeen to make way for construction works in Causeway Bay. Recent enforcement action by the Marine Department against non-compliant moorings in Aberdeen would force boats from their safe moorings at the start of the typhoon season. Mid-March, the Marine Department has issued demand letters to 100s of boats in Aberdeen Harbour for exceeding the length of their designated mooring. In addition, others have received notice reminding the owner of the mooring that he must also be the owner of the boat using that mooring. As many private moorings are sublet this is further creating mayhem. Boat owners have been given two weeks’ notice to vacate their mooring when found in breach. The Marine Department in a meeting this morning refused to extend the notice period till November when the typhoon season ends. With a dramatic shortfall of sheltered moorings in Hong Kong, an estimated hundred pleasure boats will be left without shelter at the start of the 2013 typhoon season. Rumours have it that a few privately held moorings have seen their rental increase by more than 100% for use next month. As CEO of Designing Hong Kong we call on Government to urgently create public marine centres throughout Hong Kong, to address the shortfall of safe moorings for the increasing number of boats used for tourism, pleasure, recreation and sports. This shortfall of moorings makes it impossible for people – except for the super rich – to enjoy Hong Kong’s magnificent shore lines and beautiful waters. For more information, please contact Denis Leung at 9618-8378. 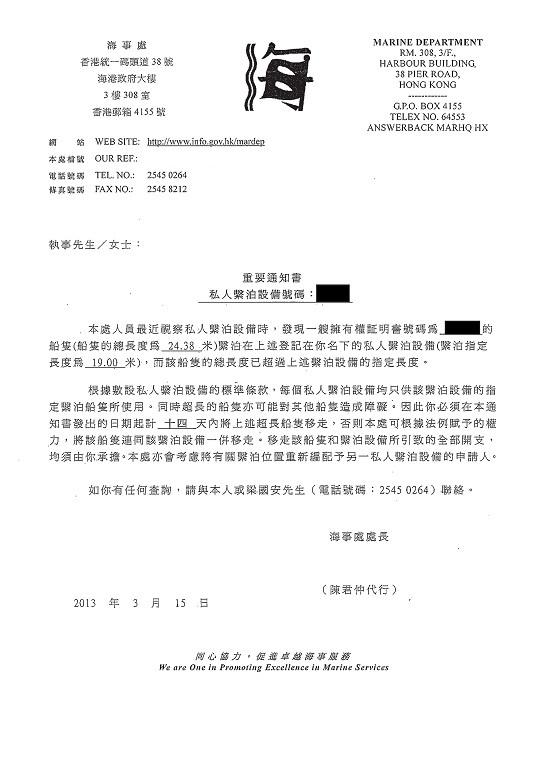 Hong Kong, 5 February 2013 – Designing Hong Kong has submitted a Section 12a planning application to the Town Planning Board for a public marine center in Tolo Harbour. The marine centre will offer affordable mooring of boats, opening up the waters of Tolo Harbour to the community for marine tourism, leisure, recreation, and water sports activities. These activities offer new job opportunities for fishermen displaced by the trawling ban. The man-made shoreline was selected to minimize the ecological impact of building waterfront facilities. The adjacent Science Park offers convenient public transport, and ample parking, retail and restaurant facilities. “The Hong Kong community deserves public marine centres where they can store boats cheaply. Hong Kong has a spectacular 1,000km coastline, 280 islands, blue waters and white sand beaches. However, boating is restricted to the super rich who can afford a private marina. Facilities are needed for the public to keep boats and water sports equipment safe at a low cost. After all, a surfboard does not fit in your home, you can’t take it on the minibus, you can’t take it on the MTR and few people can afford a car,” said Paul Zimmerman, CEO, Designing Hong Kong Limited. Pak Shek Kok is one of several locations identified for new facilities in Designing Hong Kong’s research ‘Vibrant Harbours – Water Activation Projects’. Site selection criteria include minimal ecological impacts, presence of leisure marine activities, available land, road access and minimal impact on commercial marine traffic. The application by Designing Hong Kong, Y/PSK/1, proposes the zoning of a remaining waterfront site at Pak Shek Kok as “Other Specified Uses (Marine Centre)” and “Open Space”. The public can submit comments to the Town Planning Board until 22 February 2013. The same site is proposed to be zoned Residential (Group B) in the new draft Outline Zoning Plan S/PSK/10 for Pak Shek Kok (East) which is open for public comments until 18 March 2013. Designing Hong Kong does not consider this a conflict, as both plans can be combined. “Implementation of the Public Marine Centre in Tolo Harbour will be a matter of Government to decide on. One option is to include the construction of the marine centre as a ‘Built-Transfer’ requirement with future residential land sales at Pak Shek Kok. Once built, the facilities can be operated by existing or new not-for-profit organisations,” Paul Zimmerman explained.